My pistols feature what I feel is the ultimate frontstrap treatment for custom 1911s. Called Progressive Traction Checkering™ (or ProTrac™ for short), this frontstrap texturing is an exclusive innovation from Stan Chen Custom. 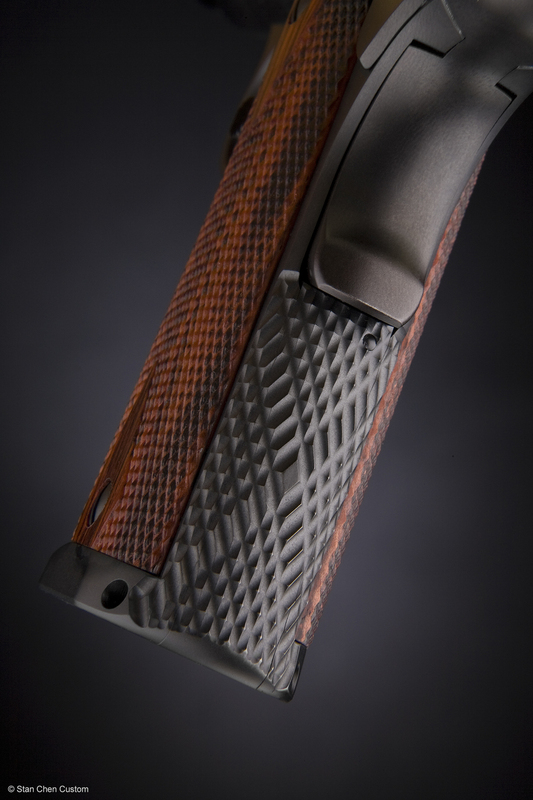 As the name implies, this distinctive texture is specifically designed to give the 1911 shooter a degree of traction which is proportional to the amount of grip force applied. In other words, if the shooter takes a solid grip on the gun, he is firmly locked into it for superb recoil control. Loosen the grip, and the pistol slides easily in the hand, should a grip adjustment be needed during a draw or a reload. So what you have is rock solid traction in rapid fire, but if you have to flip the pistol to hit the mag release for reloads, it just slides smoothly in your hand when you momentarily let up on the grip. It works great with gloves as well. The diagonal lines are also oriented to effectively counter the diagonal torque of the pistol upon firing, and offer a great deal of vertical traction, which some textures lack. Our latest version features a series of small raised ridges which cross in the middle of the frontstrap to form an X pattern. The ridges serve to give even more directional, progressive control in 4 axes to give the shooter greater control of the pistol without being overly sharp or abrasive. ProTrac™ Checkering was carefully engineered to provide these characteristics; details such as the cutter type, cutter diameter, depth of cut, line spacing, and the type/direction of the pattern itself were all carefully considered and balanced with one another to produce the desired result. As a byproduct, we produce a stunning, distinctive look as well. When compared to traditional checkering, ProTrac™ produces a very different result from a practical standpoint, by yielding the progressive characteristics outlined above. Because of the wide spacing of the lines, the individual diamonds are larger and more robust than traditional diamonds. Yet, they are NOT overly abrasive because the diamonds have a more gradual side profile and the depth at which they are cut. Extensive research and development was undertaken until what I consider an optimal blend was found. On the rear of the pistol, the checkering is not only on the MSH, but is also cut onto the sides of the frame and parts of the magwell. At first look this may seem like an insignificant detail. But these additional cuts actually yield a 53% increase in “tractioned” surface area, thereby giving the shooter greater control of the pistol. Additionally, when machined this way, the pistol has a very distinctive, solid, one piece feel in the hand.